SEPTEMBER 11 will forever be remembered for the terrorist attacks on the US that brought down the twin towers of New York’s World Trade Center in 2001. Long before that, the date September 11 holds a special meaning for hubby and me. Then former coursemates-turned-colleagues, we had our first and only shared front page byline back in 1992, with five others (four were from the Crime Desk) who worked on the story. Alas it was for a disaster story of a building that collapsed. 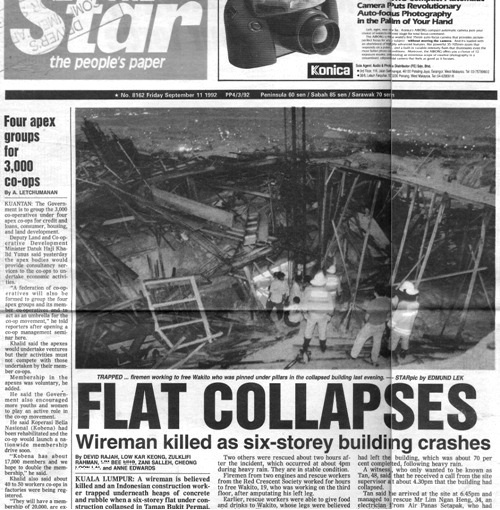 Front page of The Star, 11 September 1992.